A rock crawling remote controlled vehicle. No obstacle too tough for it! For a long time a saw other people build or drive rock crawlers, and their abilities amazed me. I never thought XL motors could give so much torque for a vehicle to give it a chance in going over the obstacles it clears. So I thought why not give it a try and see how good can I get? The outcome is much much better than I expected, it can literally go over everything (well not everything, but lots of stuff :)). The first thing I started with was the suspension. Which is the four link suspension of course. From my prior experience I thought the links in this kind of suspension must all originate and end in the same line. But after a little research I figured out they don’t have to, a thing that really helped. The next thing I paid attention to was the chassis and the axles, lets start with the chassis. Chassis for a rock crawler must be dead simple and lightweight. So what I did was to build 2 flat (2D) sides of the chassis and connect them with horizontal liftarms. The chassis consist a battery box mounting place, a receiver and 4 ball joints to mount the shock absorbers on. And now for the axles, a rock crawler needs 2 strong solid axles. The rear axel was just a solid one. But the front one had to be steered, in order to get rid of ant U-joint problems I mounted the steering M motor to the axel itself. As I always write, a conclusion. So what are we left after all this rubbish? I love this project and want to have some of my middle school students build it. However, they need building instructions. Can they be provided? As you could have read in the description they are already made. All you need to do is is click on the Instruction tab above and download the .lxf file. P.s. Don’t forget to watch the Corrections video for the instructions, because they are not perfect. LDD doesn’t have all the required parts. Hi Adam, how did it work out in school? Where can i get these parts? I have not made any kits for this model. You can buy Lego over at bricklink.com . it answers some questions and has a part list somewhere. Id like to build your Little boy Rock crawler, but I havent all of the “special” bricks. Now, Id like to now from were, do you have this brick or were do you buy your brick for your creations. I usually buy bricks from Bricklink.com. Thank you for your answer but i can’t fin the “lt steering gear” can you please post the link for this part? I can’t see any part called “lt steering gear”. Are you talking about a gear, or a part used for steering? Can you give me your E-mail adress, than I can send you an Image of this brick. i am very impressed. i love it and i couldn’t come close to that. i want to build it but i don’t have pf, so is there any way to do this with an NXT and motors? P.s. what remote do u use? There must be a way, that you must come up with yourself. And I’m using the Power Functions remote. thank you! can you use the pf remote with an NXT? I will come up with a way then hopefully post it on YouTube. i will also send you pics by e-mail if you want. 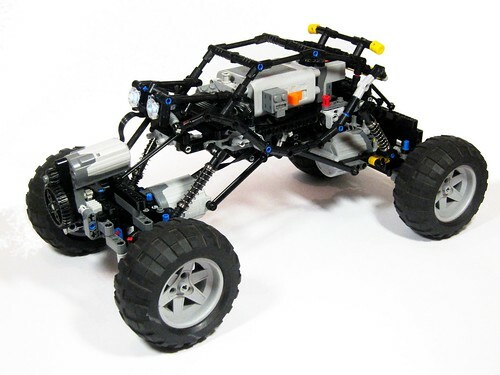 my B-day is also coming up, so i wish to get a Lego jeep. there might be some different parts due to lack of pieces. Sounds great! I would love to see pictures. i tried to make the front but i only have 4 of the 4 links, 3 live axles, and i am lacking a few other essential pieces so it might take time. i also might need to work to get that piece needed for the remote. the estimated time will be 1 month if i don’t run into any problems. In the Instructions tab at the top of the page. Does exist instructions of the Tube Chassis? you canbuy parts from bricklink.com . Try and download LDD again. would the heavy-duty yellow suspension used in the unimog u400 work, because thats all that i have. Hi, any updates in the past few years or is this a dead MOC? Though I’m working on some non Lego stuff I think about sharing online.